The Pilatus P3 is a military training aircraft built by Pilatus Aircraft Switzerland. The aircraft was designed for primary and advanced training (including night flying, aerobatics and instrument flying). The military version was designated P-3-03. It was of all-metal construction with a retractable tricycle undercarriage and tandem seating. There was provision for underwing racks for light practice bombs or rockets and a machine gun in a pod below the port wing. The first prototype was built in 1953 and flew on September 3rd the same year. The Swiss airforce received 72 examples of this aircraft while the Brazilian Navy acquired 6. The Swiss Air Force used the P-3 as a training aircraft until 1983, although it continued to be used as a liaison aircraft for another decade. In 1993-1995 65 ex-Swiss Air Force aircraft were sold to a private market. 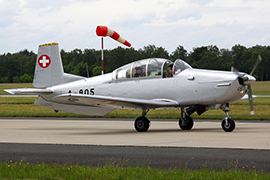 Our aircraft, the Pilatus P3 with Swiss AF # A805, has served with the airforce from 1956 to 1991. After her military career she became a privately owned Annex 2 aircraft within the French registry.